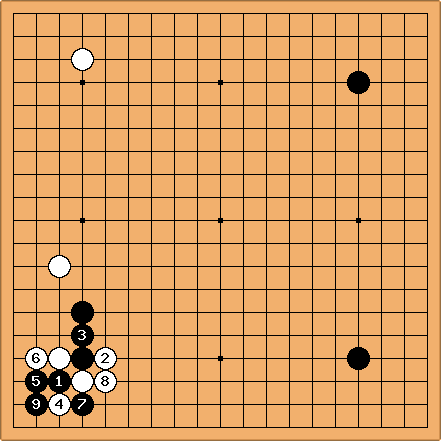 From previous study, I know Black should try to play an approach move which makes a pincer less attractive. Perhaps my choice is wrong, but I chose (a). Konrad (1d): If you are weaker than 5 dan it really doesn't matter which approach you choose, from a practical perspective anyway. Alex: The choice of approach is a tough one, but even if none of us are strong enough to give a definitive answer, it's certainly worth thinking about (see /Discussion). In general, distant approaches are good for discouraging pincers, so either a or b is likely to be good here. To choose between them, I would use a rule of thumb that I read somewhere (Whole Board Thinking in Joseki, I believe) - the high distant approach is for controlling the side, the low distant approach is for destroying it. So the question is whether you want to make territory on this side prevent either player from getting any here. Since you'll probably want to approach the top left corner at some point (perhaps at c), it looks like you'll be trying to make something on the left side to compensate for what you'll probably give White in the corners. Therefore, I think that a is probably a good move. Calvin: This is a very common fuseki and for what it's worth the most common moves for black in this position in pro games are d, e, and f followed by a and b (quite rare), exactly the opposite of what is being suggested here. I don't think white is so strong in the upper left with the direction of the komoku there, so I don't see how any standard approach move can be precluded at the amateur level. Why are you scared of the pincers? Alex: It's not a matter of being scared exactly, as a matter of not wanting to cooperate. 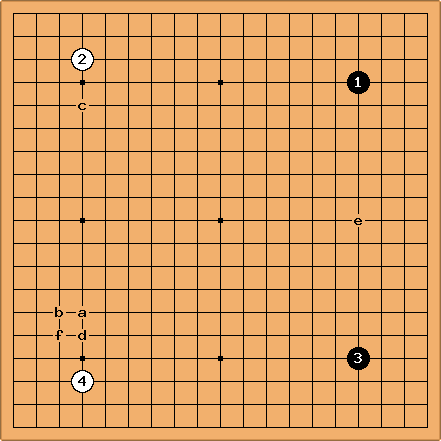 The idea of this fuseki for White is that if Black approaches both corners and White pincers both approaches, the two pincer stones will support each other, giving White an advantage in the fighting. 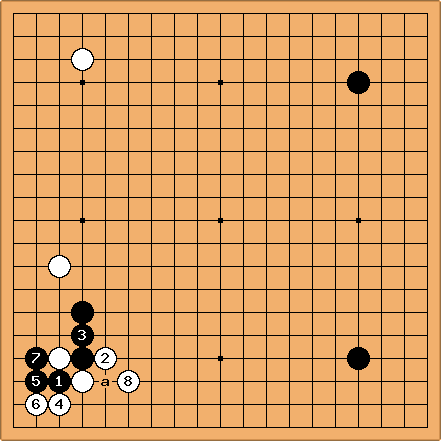 Of course, Black probably won't approach both, but then White gets a shimari. Another, but not entirely different, way of looking at it is that the direction of play from both komoku is the same - the left side. Compare an asymmetric komoku fuseki where the two point in different directions. Since both emphasize the left side, White will want to pincer. It therefore makes sense that Black will want to choose an approach that gives White mixed feelings about pincering. If pros play the close approaches nonetheless, it's probably because they feel that the local loss entailed by a distant approach is worse than the loss entailed by letting White get the fuseki she wants. 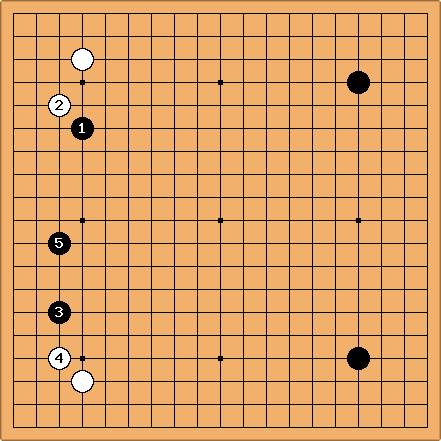 Alternately, it may be this: the theoretical ideal (for White) for this opening is if Black makes regular approaches to both corners and White pincers both. If making one distant approach is enough to ruin this, the initial close approach by Black may be made with the assumption that, if a second approach is to be made later, that one can be the distant one. Steve: As regards popular professional play, my Nihon Ki-in fuseki encyclopedia recommends d (the high approach) specifically because pincering it is less attractive than the low approach at f. e is always a nice point, but when I played this game, I was trying to practice nirensei, but avoid sanrensei. Unfortunately, I could remember that discouraging the pincer was important, but not which pincer did it effectively. Of course, the 2-point high approach discourages a pincer, but the local loss is probably too big - something I didn't realise at the time. In general, I'd say my BQM has now been answered - thanks, folks. Bill: Go Seigen would not agree that the local loss from the 2-space high approach is too big. See comment on the /Discussion page. Velobici: Bill, high or low two space approach? Looking at /Discussion, the only Go Seigen reference appears to refer to the low two space approach. Bill: Well, the diagram suggests that the high approach is also OK. Just suppose that Black had played the top approach first. Generally the high approach is harder to understand. 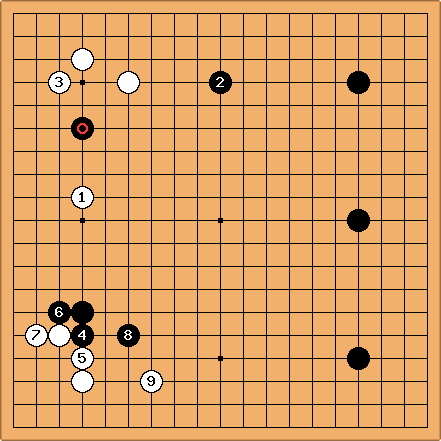 I'm posting some remarks based on Go Seigen's commentary next. OC, could be at a. , sanrensei, is simple and strong. Even if White pincers with , Black can calmly reply with . protects the corner, increasing the pressure on . Next, Black bolsters his bottom left position with - . strikes at the heart (中心点) of this position. Black sacrifices for a huge moyo, bringing the sanrensei to life. Black still has significant aji on the left side, starting with Ba. My opponent still decided to pincer, resulting in this board position. 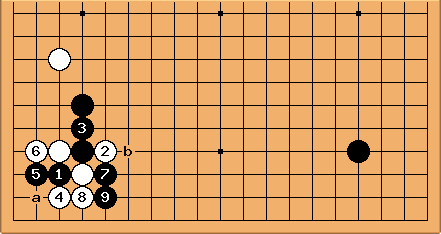 Now, until 7 is joseki, but 8 deviates from set patterns. My Big Questions are (a) how much of an error is this for White, and (b) how should White proceed from here. Konrad: (a) this looks like a natural move for white - if it's an error the difference is probably minute. (b) One alternative (that may or may not be good) is to counter-hane at a. The cross-cut as played reverts to the standard joseki, so is not an attempt to refute white's play. 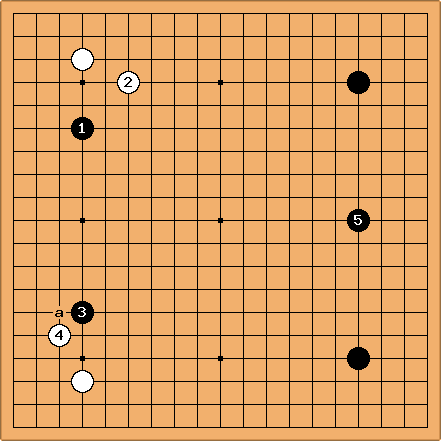 Steve Kroon: Thanks for the pointer on the standard joseki pointer - I looked into Kogo's Joseki dictionary, and found the variation you're referring to - I see it is labelled as unfavourable for White here (Black in Kogo's). Bill: While we're at it, at b, c, or d is worth considering. the sequence continues like this. He further says that Black gets good outside shape and influence but White can still connect along the side. Of course, in the game, White played instead of White 1, so Black's correct refutation should be even better than this result. Which brings us to tderz's comment on the actual game continuation. zinger: I don't understand the purpose of here - it just looks like gote. Wouldn't a be better? And after , isn't white b a good splitting move? Bill: I might well play an approach against the top left corner instead of , myself. However, is good. It effectively cuts White in two and makes some shape. (We assume the sente exchange, Bc - Wd.) a and b are not too large, as Black has an open skirt after . For reference, the game continued as shown below. tderz: is an unnecessary and vulgar atari (in a cross-cut & in general). AND you could chose from which side! Steve Kroon: So it seems after , White has made a slight overplay, and Black has taken the chance to go down a locally favourable path. But now White has deviated from the path playing the "vulgar atari". So the question now seems to be how Black should make the most of this. As Black I was dissatisfied with this, since I have a floating group in the centre, and White ends with sente (Black 2 is not entirely necessary, but things get messy without it, and white seals Black in entirely in sente, it seems to me). Dieter: I share your dissatisfaction, not for what happened before but because of . I prefer the exchange of a - b before playing . Steve Kroon: So you think with the a-b- exchange and White taking sente this is a fair result for Black? I ask because White's next move was at c, so a move around a by Black next would then have equalized things, if I understand you correctly. Unfortunately, instead, I played d and the sequence went on to g after which I gave White a nice wall above my stones. Konrad: Results in these fighting variations are hard to evaluate - I prefer white here, but it's still playable for black. If black omits a, white has the opportunity to play there himself, which can become very complicated if black then cuts. After white plays a solid move at b or c black probably needs to add a move around a, possibly after first playing a kikashi sequence starting with d or something similar. Konrad What's perhaps more important to point out here is that your move f is aji-keshi, removing the aji of the almost-working tesuji at x. Try to read out the sequence if black plays x instead of 2. Then imagine what might happen if black, say, crosscuts at y instead of f.
Steve: Thanks - I didn't realize that it was aji-keshi. Konrad: On second thoughts comment is a bit rash - I wanted to point out the idea of x (which doesn't work), but I see no concrete way of demonstrating that f is aji-keshi. For instance, my suggested y can be answered at f and black may have lost more than he gained. All I have is a vague feeling that it _might_ be aji-keshi, but I could be entirely wrong. Our post-game discussion led us to this. White plays 6 because his 6 in the real game is refuted by, for example, kokiri's diagram below, or a move at the 2-2 point (rather than what Black actually played. After 7, a defensive move by White seems necessary, so Black can take sente after 8. How good is this result for Black, and how should he use his sente in terms of approaching the upper left corner without ending under too much pressure? Bill: After Black can still atari at a and take the outside -- and I think he should. Konrad: Indeed - the 2-2 point is a neat tactical refutation, while kokiri's suggestion is a nice wakeup call to keep the whole board in mind. However, white at 2-2 gives up sente unnecessarily - it should be a solid connection instead, which would force the same response, then white can play a slightly wider extension at the bottom. This type of connection is a useful move to try and learn. I'm not sure whether the result is good for black - personally I'd still go for kokiri's idea to take the outside (which is another reason why playing at 2-2 is wrong). kokiri - what about this way, if at a, Black b looks good to me. Bill: I agree with kokiri. Make two, then throw away. After Bb Black's thickness is impressive, and the exchange, - , is plainly bad for White. Steve Kroon: I gather this is Konrad's current suggested path after . How is Black a instead of ? And, Konrad, by a longer extension along the bottom for White, do you mean , or b, or even further? 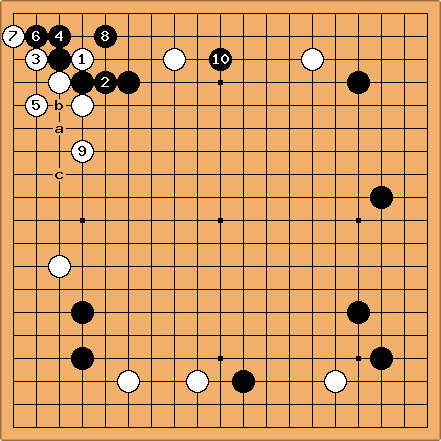 Your objection to at a was that it gave up sente, but after this sequence White has still given up sente, right? I still feel this is unsatisfactory if you compare the result to the "How to continue" diagram above. 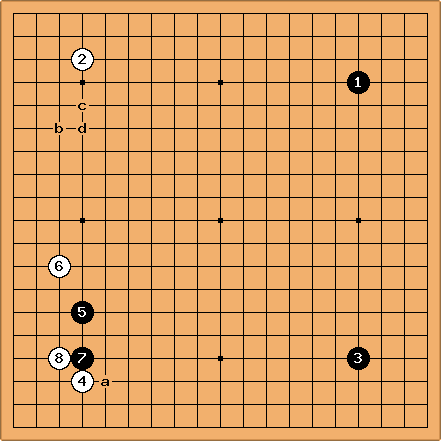 Is the difference acceptable given that White has sente in the "How to continue" diagram? Konrad: I don't know where the extension should be - that's why I didn't say :-) Best to consult a joseki book - I seem to remember having seen sequences similar to this. 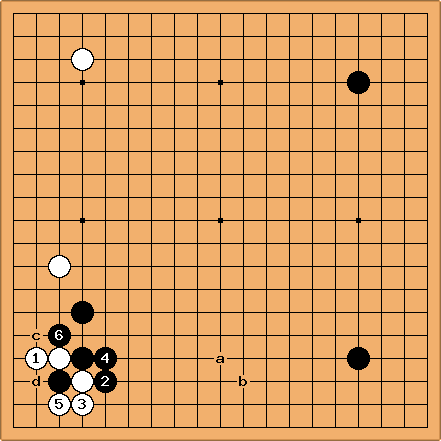 Yes, white still gives up sente, but gets a wider position for it and has started neutralising black's hoshi stone. Konrad: I assume your dissatisfaction for black will disappear if you follow up with a pincer as in the game cited by Dave. You probably need to have the stone at a to feel happy with this though. Dieter: I'm positive that should be at a. 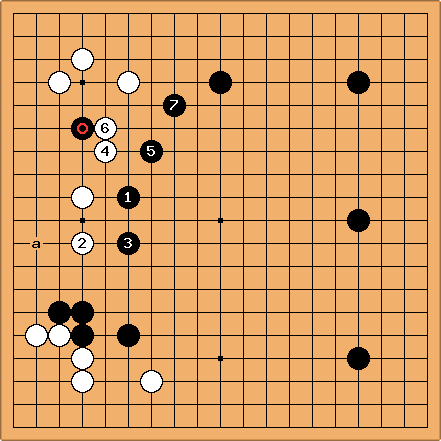 There is not enough bad aji in Black's connection not to go for the points here. unkx80: I agree with Dieter, and I say that should be at least at b. But don't you find White c very annoying? Konrad: White c was why I didn't initially like a, but I agree black should play a first - omitting it is just too painful. Then black can play 8 in Dave's diagram next. Dave: This position arose by transposition in a two-stone handicap game played in 1879. 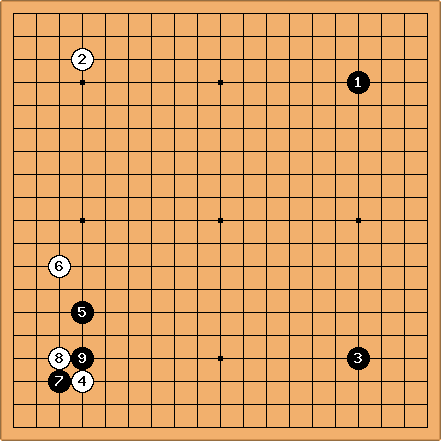 It is one of the earliest games featuring the pincer against the two-space high approach. After , White has to connect at to prevent the counter-cut suggested above. This allows Black to turn at and make good shape with (eliminating unkx80's point above). White needed to add another stone on the left or Black would have been able to play in and threaten the top left stones while cutting them off from the stone below (think something like the exchange Ba, Wb, Bc). However, Black then played into the top instead. His upper left corner is quite strong. As far as I know, the cut at was not repeated in professional play. The double-hane at and the immediate hanging connection at became standard replies. tderz: My reasoning would be that here is as unnecessary as in  above. It is just a lost stone and the whole sequence had the same threatening value if it had not been played.